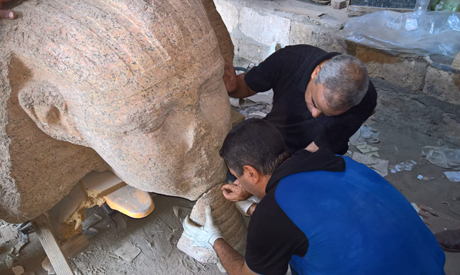 The Grand Egyptian Museum (GEM) received a red granite head Friday from a statue of King Senusret I from the antiquities ministry storage galleries in the Cairo Citadel. The transportation came within the framework of the Ministry of Antiquities’ mission to prepare for the museum’s grand opening, which is scheduled for the first quarter of 2019. GEM’s general supervisor, Tarek Tawfik, explained that the head is carved from red granite and has the common artistic features found in pieces attributed to the Middle Kingdom. The head, which was discovered in 2005 in Souq Al-Khamis at the Matriya archaeological site in 2005 by an Egyptian-German mission, portrays the facial features of King Senusret I wearing a partial headdress. The statue’s royal beard, which was discovered separated 10 metres away from the corresponding head in 2008, was also transported to the museum. The head, according to Ayman Ashmawy, the head of the Ancient Egyptian Antiquities Section who discovered the artifact in 2005, measures 122 cm x 108cm x 75cm and weighs roughly two tons. Eissa Zidan, general director of the First Aid Restoration Department at the GEM, said Friday that the restoration team and archaeologists used the latest technology in the packing and transportation of the head and beard, which required wooden beams to settle the objects onto a hydraulic crane for lifting. The head and beard are now at the GEM conservation centre for restoration, study, examination, analysis and documentation, while a three-dimensional imaging technique will be used to illustrate the suggested methods to re-attach the head to the beard.